A campaign by a terminally ill doctor to encourage healthcare staff to introduce themselves to patients is being supported by more than 90 NHS organisations. 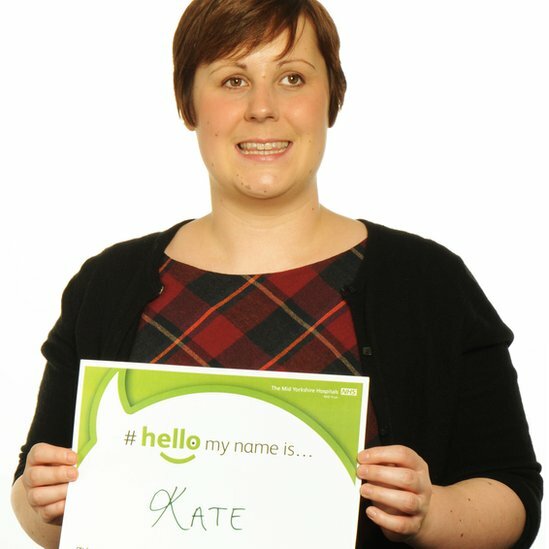 Dr Kate Granger, a 31-year-old hospital consultant, started the “Hello my name is…” campaign while being treated for cancer. She felt frustrated by staff who failed to tell her their names. David Cameron, Jeremy Hunt and Bob Geldof are all supporting her campaign. Dr Granger started her campaign to improve the patient experience in hospital, shortly after she was diagnosed with a rare and aggressive form of cancer three years ago. The doctor who informed her that her cancer had spread did not introduce himself to her and did not look her in the eye. She was also dismayed by other staff who failed to introduce themselves when caring for her. She subsequently set up #hellomynameis on Twitter. Her campaign reminds staff to go back to basics, build trust and make a vital human connection with patients by – at the very least – giving their names. Speaking on BBC Radio 4’s Today programme she said: “The lack of introductions really made me feel like just a diseased body and not a real person”. When someone did introduce themselves, she said, “it really did make a difference to how comfortable I was and less lonely I was in hospital”. It has now become a national campaign and has the support of more than 400,000 doctors, nurses, therapists, receptionists and porters across over 90 organisations, including NHS Trusts across England, NHS Scotland and NHS Wales. The Scottish government announced on Monday that it was allocating £40,000 to NHS boards to roll out the campaign across the country. The Mid Yorkshire Hospitals, where Kate is now working, were the first to sign up and the movement spread from there. Trusts are now sharing ideas about how to boost compassionate care for patients across the UK. Dr Granger said the main message from the campaign was about treating patients with respect and dignity. She said: “I got my cancer diagnosis three years ago and unfortunately I’m not going to get better, I have a rocky road ahead of me. “I want my legacy to be a better health service. Health Secretary Jeremy Hunt said the campaign was inspiring. “All patients should be treated with compassion and the fact this movement has started from within the NHS itself makes it all the more powerful. Jeremy Taylor, chief executive of National Voices, a national coalition of patient charities, called it “a fantastic campaign”. He said the NHS had made enormous progress but, too often, simple basic care was forgotten. “Staff don’t have the time and don’t stop to think about the impact simple care can have. “We need to put the human back into healthcare. Originally published by BBC online.